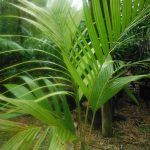 Palms for Autumn Planting, Part II - Richard Lyons Nursery, Inc.
Acoelorrhaphe wrightii, commonly known as the Paurotis Palm, is one of the dozen palm species native to Florida. 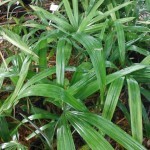 Its home is the Everglades, so in cultivation it likes copious amounts of water. 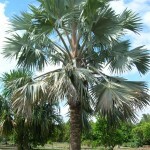 A palmate species, it features multiple thin, graceful stems covered with black fibers. Over a long period, it can reach 30 ft. in height. Paurotis fruit ripens from white to orange to black. 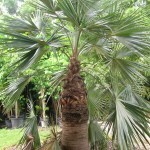 The palm is hardy to at least 25°. Actinorhytis calapparia is a single-trunked, pinnate species native to rain forests from the Solomon Islands westward into Papua New Guinea. 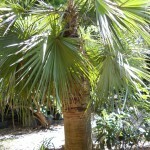 It needs shaded conditions when young, but can later tolerate stronger light. Leaves recurve like those of Carpentaria. This species produces large red fruit to about 3 in. long. 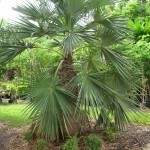 It matures to 20+ ft. in southern Florida. 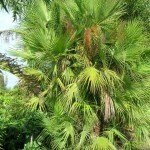 Bismarckia nobilis is a species endemic to Madagascar. It grows to about 40 ft. in our region. Its large gray-green palmate leaves and stout trunk provide a very striking landscape element for sunny exposures. 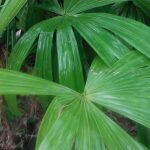 Once acclimated in the ground, Bismarckia is perfectly attuned to our hot, rainy summers and cooler, dry winters, and it is capable of surviving temperatures in the mid-20s, particularly as it ages. 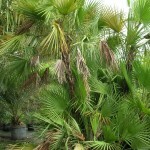 Chelyocarpus chuco, a native of Bolivia and Brazil, is still uncommon locally. 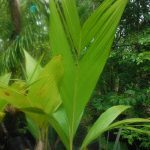 It produces glossy, circular palmate leaves and grows to 30-40 ft. in southern Florida. Seedlings need light shade, but older plants handle full sun. This species thrives in moist soils and can withstand 30-32°. 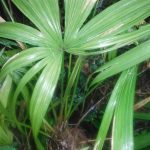 Coccothrinax spissa differs from most other species in the genus: 1) Seedlings require some shade and 2) The trunk is fairly stout and often swollen in the middle. 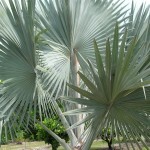 Native to Hispaniola, it reaches 15-20 ft. in our region. Provide sun and moderate watering. Once established, it tolerates drought well.